Autonomous & Wireless, POD® Indoor Air Quality (IAQ) monitoring system is designed for indoor air quality monitoring in workstation, open space, factory, warehouse, hotels, hospitals, shopping mall, airport… POD® IAQ consists in a network of indoor analysers with high precision sensor for low ppb gas concentrations in ambient air (H2S, RSH, NO2, NH3, SO2 …) as well as VOC, odours, noise and particles detection correlated with Dynamic olfactometry with high accuracy in ppm, ppb or OU/M3. POD® Indoor Air Quality (IAQ) monitoring system is a standalone, sensor based, multiparameter air quality station designed to monitor physical and chemical parameters including allergens in an unlimited range of indoor environment including office, factory, warehouse. POD® Indoor Air Quality (IAQ) monitoring system offers the key functions and tools to establish and optimise the wellness mapping of working environment. With analytics and nuisances alarms, the POD® Indoor Air Quality (IAQ) monitoring system can also interface venting and indoor air filtration systems. Shaped as an elegant object, it can be wall mounted , or used on a desk, or in any working environment. It measures continuously 8 parameters pertaining to comfort and health but also to allergens, VOC (Volatiles Organic Compounds) and toxics. Anybody can also express oneself and give opinions about the perceived environment. The POD® Indoor Air Quality (IAQ) monitoring system carries a QR Code and you can report his feelings and perceptions wherever you are. RubiX PoD allows to collect real-time, analytics data on nuisances and building performances along with people’s well-being perception. 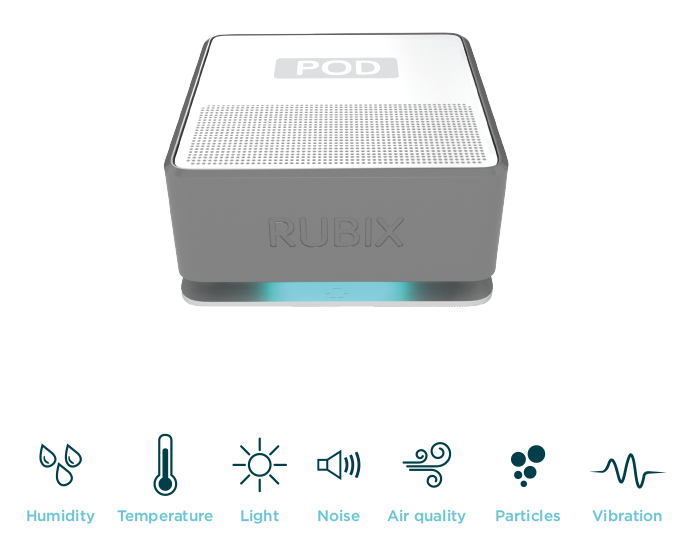 Modular and scalable, the POD® Indoor Air Quality (IAQ) monitoring system network is sized to your needs. Standalone analyser or sensor network results are available room by room, building by building, site by site or on a regional scale. For large indoor environment the POD® Indoor Air Quality IAQ instrument network provides real-time accurate indoor air quality data for efficient management of chemicals and olfactory nuisances. 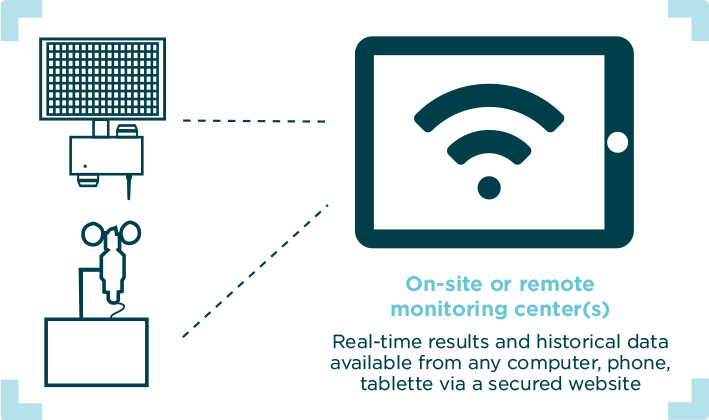 Results can be accessed from the RUBIX Soft SAS secured website, using your web browser to access safely your data, 24/7, anywhere in the world. POD® Indoor Air Quality IAQ uses high-precision sensors for pervasive monitoring of pollution and nuisances. The concentration level (ppm or ppb) and sensor combination are defined based on the application requirements. The WT1® can be equipped with up to 4 gas proprietary electrochemical sensors including but not limited to H2S, NH3, mercaptans, SO2, CO, Ethylene Oxide, O3, Methane, Cl2 … in addition to the VOC (PID) and Particles PM, vibrations, temperature, humidity measuring blocks.